I was born in June, a solid Gemini baby, but September is my favorite month. The dread-hell of August heat and, in the Pacific Northwest, smoke and ash in every crevice of everywhere, is over. The melting fireball sun that seems to predict imminent apocalypse has lost some of its power, clouds filtering in to calm it the hell down. The air is breathable and cool. Mornings are perfect for hot coffee and a book, afternoons are perfect for iced coffee and a book. The reason I bring up astrology – which is one of the queer-dominated areas of culture that I just do not pay attention to, usually – is that this twin-sign read Leah Dieterich’s new memoir-ish novel-ish book Vanishing Twins (from the awesome Soft Skull Press), and it brought up a lot of things I haven’t thought about in a long time. Like how I used to be obsessed with twins. As a kid, I wanted one so badly. I voraciously consumed literally everything the Olsen twins were involved in. At school, we had two sets of twins, and when I saw them on the playground I would stare endlessly at them, my mind alive with wonder. What would it be like to share a face with someone? An entire parallel life? Were they telepathic? Eventually I outgrew this fascination, but Vanishing Twins made me think for the first time about Vanishing Twin Syndrome, which is apparently a thing that some people have if they had a twin in the womb that they then absorbed. Just like Aunt Voula from My Big Fat Greek Wedding! I guess there’s also a theory that left-handed people are more likely to have Vanishing Twin syndrome, and hey, I’m also a lefty! All of this is about as dubious as astrology, which is to say pretty dubious for me and not for others. But it did give me pause. Twins came up again in another book I read this month, which is one of my two favorite books of the year so far (the other is Amateur by Thomas Page McBee): Pretend We Live Here by Genevieve Hudson. (I wrote a full review of it for Necessary Fiction). My favorite story in this collection is ‘Holes,’ which is one of the most perfect things I’ve read in my life(?!) In it, a character recovering from throat surgery longs for her first love, Tonya. The title fits the story perfectly: holes are everywhere. In the narrator’s body, cut open; in Tonya’s body, scarred from a childhood surgery; in her heart; in her ability to communicate; in her memory; in Tonya’s current life, a shell of her former self; in the sense of a missing twin or soulmate. Hudson uses the word twin in her exploration of these women’s relationship. 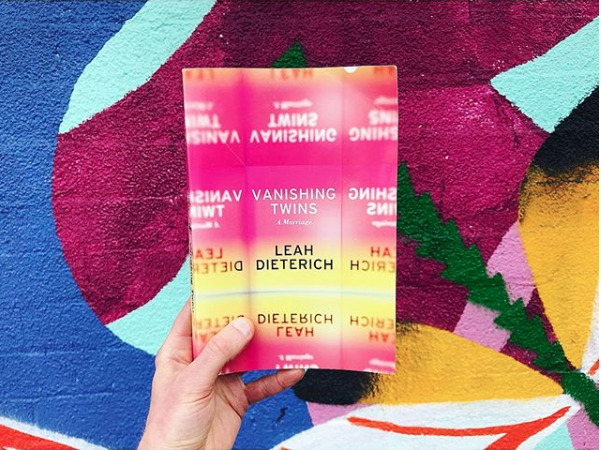 In doing so, she does something Dieterich also does: probes the mystery of intimacy, the gray area between platonic and romantic. It’s like we’re the same person. We finish each other’s sentences. This is what we’ve been taught to desire and expect of love. But there’s a question underneath that’s never addressed: once you find someone to finish your sentences, do you stop finishing them for yourself? We reached inside each other as though reaching into our mothers, trying to pull our long-lost twins out by hand. Come! Come! Our voices echoed. I cannot face this world without you. The air is dry. The mirrors are glass. I need your gaze to show me who I am. What?! You can do that? He inspired an immediate urge for imitation… I felt the warmth of solidarity within the difference of our sameness. I’d always seen struggle as negative, something to be hurried through on the way to agreement, a state I associated with a deep and pleasing harmony. I had forgotten that harmony requires at least two different voices singing two different notes. 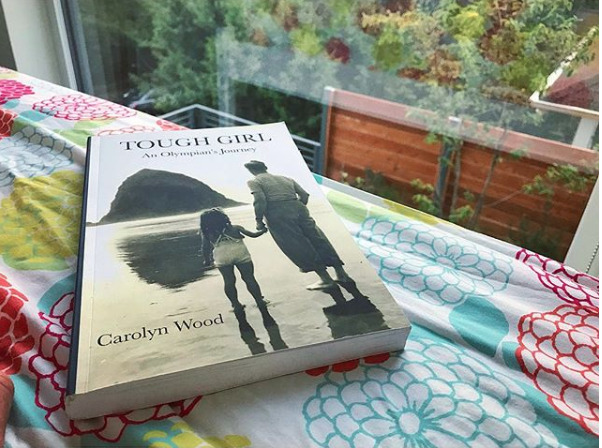 Speaking of interdependent relationships, I also read Carolyn Wood’s Tough Girl: An Olympian’s Journey, (just re-released by Seattle Penguin imprint Sasquatch Books) in which two major relationships dominate the narrative. The first is the intense relationship she had with swimming as a young person, competing in the 1960 Rome Olympics. The second is the 30-year relationship she had with her partner Rose, which left her heartbroken and seeking strength and solace within herself when it ended. Her childhood and competitive swimming career are one track of this memoir; the other is her solo journey on the Camino de Santiago while grieving her relationship with Rose. Give me a story about a queer lady athlete and I'm almost guaranteed to be into it. (She’s like my twin!) The bonus with this book is that Carolyn Wood is a pretty great writer. Both threads make for wonderful reading, and enhance each other by illustrating the similarities and differences between intense athletic training and a slower, longer, more deliberate journey to walk a very long way and work through the pain of a devastating breakup. The book also stays the course of the story it's trying to tell: it's not an exhaustive account of her entire life (though I would definitely read that if she were to write it), but rather about these two (twin!) chapters of her life (with a few more details/context thrown in at the end for good measure). That's a real strength of this memoir- the reader doesn't get lost, and it makes for a more powerful and potent narrative. When and athlete loses a race or sustains an injury or even quits for a while, the return is called a comeback. Along the Camino, I planned to practice letting go so I could stage a comeback, a return to happiness, but it’s not as easy as I hoped. I have no guide, no coach, no mentor. No one who blows a whistle to start the race. No one gives a pep talk, sets the pace, or holds out her hand to pull me along. When those moments arrived and I hadn’t surrendered to the I can’t do it, I felt calm and sure and sweet in my fatigue. Through long, hard training, I discovered an inner strength and, with it, confidence… It’s good to know how to override the voices that fool you into quitting. I did want it. I’d been waiting for today more than two years. You get an idea about something you want, and you wait years for the chance. Life fills up the time with ordinary things – school, meals, homework, telephone calls and TV shows, books, play, practice. But when the thing you want gets a date – say, August 3, Olympic Trials 100-meter freestyle final – time becomes stretchy, changeable, surging forward and then slowing to an ooze. Meanwhile, 2012 Camino-walking Carolyn Wood reflects on the fact that “No always came easy when I was scared.” She said no to herself, to coming out, to believing there could be peace in being openly gay, for a long time – long enough to marry a man and have a child. When they divorced and she did come out, she lost custody of her son because of it. He would visit on weekends and she did her best to turn him into a feminist (seems like she succeeded). Exhaustion quiets inner voices too. These reviews are from my Goodreads, where we can be reading buds if you want! I also read Jesmyn Ward’s Where the Line Bleeds, the first in the (loose) Bois Sauvage trilogy, which I have now completed. I’m a huge Jesmyn Ward fan, so I went into this debut with sky-high expectations. It wasn’t quite as transcendent of a reading experience for me as Men We Reaped, Salvage the Bones and Sing Unburied Sing all were, but I still enjoyed it. I think it could’ve benefitted from tighter editing actually, because there were a lot of words repeated in consecutive sentences and little things like that that kind of distract from the story. That said, her writing skill still shows in this book, if a little less polished than her later works, and I actually really like being able to see some evolution in her writing. The story itself is quiet and atmospheric, which are two things she’s mastered. I can never tell the moment I feel deeply invested in her characters because it happens slowly and subtly, but it always happens. This story’s slow pace seems to match the southern summer in which it’s set, but its climax is like a gut-punch and the ending is beautiful. I cried like I do at the end of every Jesmyn Ward book. I would definitely recommend this read but if you’re new to Jesmyn Ward I’d start with one of the other works I mentioned above. Next is The Fire This Time! Conversations With Friends by Sally Rooney: This is the most stereotypically millennial story ever. It's so existential and full of characters who are simultaneously completely self-absorbed and also extremely empathetic and loving toward each other. (Well, not always, but sometimes). There's writers! There's queers! There's exploration of mental health and angst around the idea of motherhood! There's endometriosis! Book events and poetry performances! And then there's the affair that is the central plot point in this not-heavily-plotted book, between bisexual narrator Francis (age 21) and handsome married very straight actor Nick (age 30-something). I found Francis both compelling because of how recognizable she is and grating because of how recognizable she is. She's definitely 21, let's put it that way. But I thought Sally Rooney did a great job of writing dialogue and creating flawed characters that weren't so flawed that I stopped caring completely. I wouldn't say this is my favorite book, but I enjoyed it a medium amount! People seem to either love or hate it but I'm solidly in the middle. Motherhood by Sheila Heti: Reading this immediately following Conversations With Friends made for an overwhelming amount of existential angst in my reading material, but despite the fact that I found the narrator of this book to be annoyingly cliche in the beginning, I ended up really liking it by the end. There is such an irritating plethora of books/content by straight women who are having doubts about whether or not to have kids that this book could’ve easily been as boring as most of the books in this new genre seem. But MJ Franklin (formerly of MashReads and currently of NYT) loved it and I love him so I gave it a whirl. Sheila Heti is a great writer, and she follows her twisty thoughts to some interesting and ultimately really resonant places. I’ve never felt any desire to be a mother and I’ve also never felt bad or weird about that. Maybe queers like me don’t feel societal pressure to have kids the same way The Straights do (a point Heti touches on briefly), but as a person who loves women/femmes in general, and who is a woman, I can still get into some thinking about why people choose to have children. (Many don’t have a choice but I won’t get into that here). Because, as is clear in Heti’s story, having kids is about more than just having kids. There are a lot of great quotes in here and in the end I found I related to a lot of it despite my very different approach to the subject. So thanks MJ Franklin! And yes I would recommend this book, but I won’t be diving into all the other should-I-shouldn’t-I parenthood memoirs. The Book of M by Peng Shepherd: This book was not for me. I'm not sure why I finished it actually, other than I crossed the halfway point without hating it and kept hoping there would be some kind of exciting twist that would grab me. There were plenty of twists, but I just didn't care that much because, despite a lot of backstory for most of the characters, I wasn't really invested in any of them. This book is part dystopian fiction, part fantasy, and part religious parable; I love a good dystopian novel, but fantasy and religion are not my genres. Points for cultural diversity among the many, many characters, and also some gay dudes, but this story felt more and more unraveled as it went along. I found the ending to be kind of annoying too, mostly because the religious bent became an increasingly dominant part of the story as it went along and the end was just... well, to repeat myself, not for me. America for Beginners by Leah Franqui: I really enjoyed this book; it was quite the adventure story with a diverse (in age, cultural background, sexual orientation) and quirky cast of characters, most of whom I felt at least somewhat invested in. I liked that it switched perspectives while remaining in third person- it kept me from being confused about which particular "I" was narrating. This is a road trip book that I could totally see being made into a movie (one I would definitely see), and it balances plot, emotion and character development pretty well. The characters are flawed for sure, but still fairly easy to empathize with, and writing characters like that takes real skill. At times I was incredibly absorbed in the story and at times a little apathetic, but overall I liked following this motley crew and its adjacent characters across the U.S. and into a deeper understanding of each other. The ending felt a little too neat to me, and there's a tiny reincarnation thread that just took me out of the emotion in that part of the book because it seemed silly (again, to me). There was also one kind-of mystery that never got resolved and left me really wanting to know the answer, especially given how nicely everything else was wrapped up. But overall I would recommend this book, especially if you're looking for an easy and fast-moving read with compelling characters and a mostly satisfying ending. Florida by Lauren Groff: Really getting back into short stories these days, which I haven’t done since college. I forgot that the form lends itself to the weird, and these stories definitely are weird. But there’s so much beauty in the unsettling, especially when Lauren Groff is writing the sentences, which are flowery enough to really get my soft spot for poetic prose. Every story is super atmospheric, and even though I don’t tend to seek out the perspective of white mothers who are either in or from Florida, which many of these stories include, I was pretty captivated most of the time. 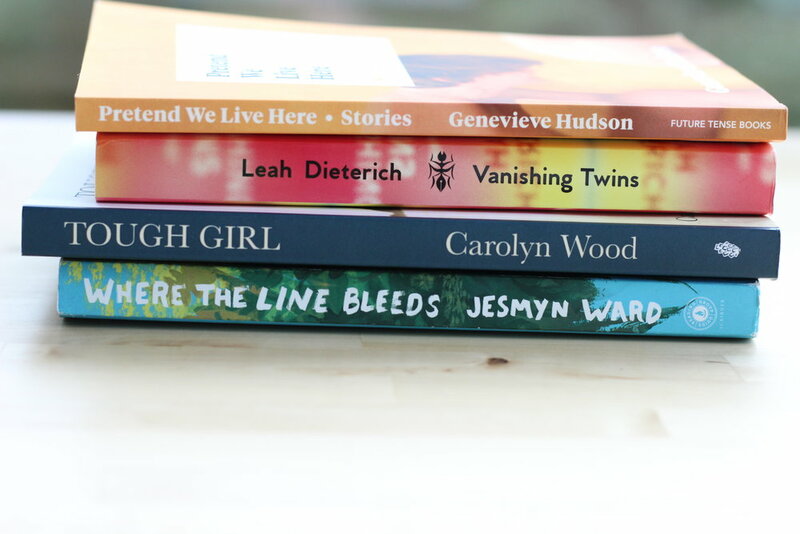 There’s a lushness and an eeriness to these stories (funny, I think I said the same thing about the last collection I read, Pretend We Live Here, which also had some stories set in the south) that hovers right below the surface, so that it’s almost jarring when something really dramatic happens. I really love Groff’s writing even though her subject matter usually is not for me, but I will read Delicate Edible Birds anyway (won’t read Fates and Furies, I just won’t). I would recommend this book, and also recommend the audio because her voice is so smooth?! She should read everything out loud. That's it for this month, please let me know who/what your reading inspirations are! I am also a Book Depository affiliate; if you decide to purchase any of the books I review via the links provided, I will receive a (very small) commission.